When fishermen get fishing opportunities, they usually take them. Birthdays, holidays, anniversaries, doesn’t matter, they usually take the back seat to a fisherman’s wants or dreams. 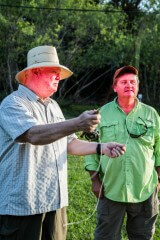 Such is the case on Sunday, December 20, 2015, on Sanibel at Norm Zieglars Fly Shop. That day presented itself with an opportunity to cast a bit of history. Ernie “Woody” Wood, son-in-law of the late John Voelker a.k.a. Robert Travers (author of “Trout Magic,” “Trout Madness” and “Anatomy of a Fisherman”, Anatomy of A Murder”), broke out some of his vast collection of bamboo fly rods for us to cast. 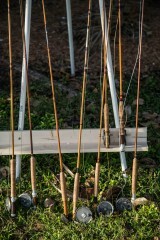 Many of the rods belonged to Voelker himself, all crafted from legendary rod makers. 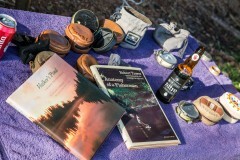 A small but dedicated group of casting geeks got together to cast the rods and learn of their history from Woody. We even got some casting lessons from Joe Mahler, the person responsible for making this afternoon possible. Thanks Joe and a special thanks to Woody for sharing some interesting history!